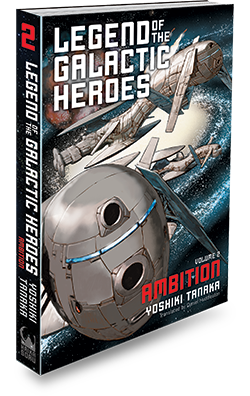 ﻿ Legend of the Galactic Heroes, Volume 2: Ambition « Haikasoru: Space Opera. Dark Fantasy. Hard Science. After a coup d'état erupts in the Free Planets Alliance, military strategist Yang Wen-li is ordered to use his tactical wizardry to put down the rebellion, but the ringleader holding the capital is someone he once trusted deeply. Meanwhile, in the Galactic Empire, Reinhard will soon face a new trial, as in the wake of the emperor's death he stands amidst an intensifying power struggle among the aristocracy. The unbeatable magician and the unstoppable genius: the battles these heroes wage will send shock waves across the galaxy! It’s the LEGEND OF THE GALACTIC HEROES giveaway contest! Yoshiki Tanaka was born in 1952 in Kumamoto Prefecture and completed a doctorate in literature at Gakushuin University. Tanaka won the Gen’eijo (a mystery magazine) New Writer Award with his debut story “Midori no Sogen ni…” (On the Green Field…) in 1978, and then started his career as a science fiction and fantasy writer. Legend of the Galactic Heroes, Volume 1: Dawn, which translates the European wars of the nineteenth century to an interstellar setting, won the Seiun Award for best science fiction novel in 1987. Tanaka’s other works include the fantasy series The Heroic Legend of Arslan and many other science fiction, fantasy, historical, and mystery novels and stories. During the space of eight hours, Reinhard’s armored grenadiers charged nine times into Corridor Six and nine times were beaten back. Among the high-ranking officers of the imperial military, including both pro- and anti-Reinhard factions, no man had killed as many people with his own hands as Ofresser. Born a low-ranking aristocrat, this man had reached the highest echelons of the imperial military not through political power, and not through tactical wizardry, but simply through the sheer amount of rebel blood he had spilled. This man had flooded Corridor Six with the gaseous explosive known as Seffl particles, denying his opponents, and his allies, the use of even light firearms. Determinedly using only his body and his physical strength, he kept on fighting to send one more, just one more opponent, to death. His tomahawk, as though making its own the gruesome desires of its owner, smashed the bodies of Reinhard’s men, reducing them to blood-splattered chunks of meat.